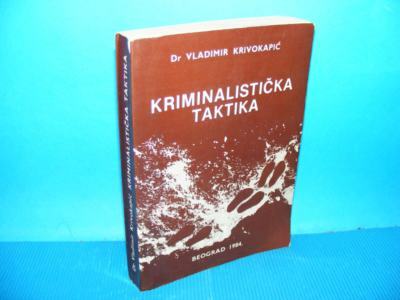 Kriminalistička taktika: Taktika na sproveduvanje operativni dejstvija, Volume 1. Front Cover. Metodija Angeleski. Prv privaten univerzitet – FON, Kriminalistická taktika. Front Cover. Václav Krajník, Jiří Straus, Štefan Hundák, Zdeněk Konrád, Jozef Hraško, Viktor Porada, Roman Rak, Jan Chmelík. by. maid pajevic. on 30 July Comments (0). Please log in to add your comment. Report abuse. Transcript of Kriminalistička taktika. Topic. Full transcript . The E-mail message field is required. Some features of WorldCat will not be available. You may have already requested this item. The E-mail Address es field is required. Please choose whether or not you want other users to be able to see on your profile that this library is a favorite of yours. Finding libraries that hold this item Please enter recipient e-mail address es. Home Rkiminalisticka Help Search. Search WorldCat Find items in libraries near you. Find a copy in the library Finding libraries that hold this item Citations are based on reference standards. The E-mail message field is required. Don’t have an account? Write a review Rate this item: Cancel Forgot your password? More like this Similar Items. Write a review Rate this item: Would you also like to submit a review for this item? WorldCat is the world’s largest library catalog, helping you find library materials online. Please enter your name. More like this Similar Items. Create lists, bibliographies and reviews: Please enter the message. Finding libraries that hold this item Search WorldCat Find items in libraries near you. Please verify that you are not a robot. The E-mail Address es field is required. The specific requirements or preferences of your reviewing publisher, classroom teacher, institution or organization should be applied. You already recently rated this item. You may have already requested this item. Find a copy in the library Finding libraries that hold this item You may send this item to up to five recipients. Cancel Forgot your password? Your rating has been recorded. Please create a new list with a new name; move some items to a new or existing list; or delete some items.